Title: HENRICI CORNELII AGRIPPAE ab Nettesheym, DE INCERTITUDINE ET VANITATE SCIENTIARUM Declamatio invectiva, denuo ab autore recognita, & marginalibus annotationibus aucta. Capita tractandorum totius operis, sequentes indicant pagellae. Description: No place [probably Cologne] but no place given, No publisher [probably Eucharius Cervicornus] but not given 1540 approx but no date given] Large woodcut portrait of Agrippa on the titlepage supposedly after Woensam of Worms. . 142x95mm early 19th century boards with slightly damaged label (tips rubbed) All edges red, 200 unnumbered leaves (A+a-i+k-u+x-z+aa all in 8). The probable place [Cologne], publisher [Cervicornus] and approx date  of this copy are derived by comparison of its title format, portrait & number of leaves with German library copies referenced in VD 16 A 1161. Manuscript note on the flyleaf by a 19th century Warsaw owner mistakenly dates the book to 1527. Several names written on titlepage, 2 of which are heavily crossed out with some bleed through to blank verso; some paper browning and some underlining increasing towards the end. Last two leaves damaged, one with silking to upper half, and final leaf (printed on one side only) repaired by mounting onto a newer leaf with 12 lines lacking a few letters each, which have been inked in. *A rare early edition of this important work which was placed on the Index of Prohibited books. In fact all Agrippa's books were controversial and brought him into conflict with both church and state. 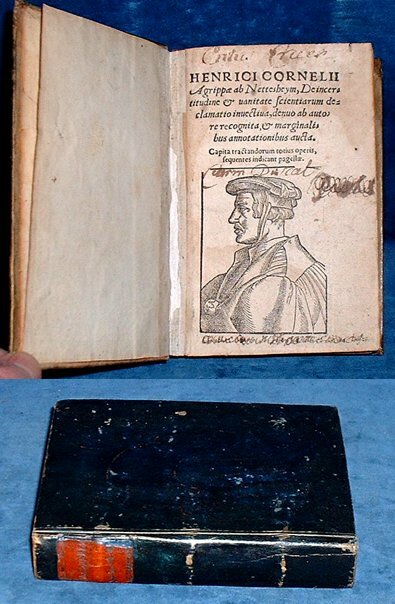 In 1531 Erasmus wrote that everyone was talking about Agrippa's new book De Incertitudine. Erasmus later had his servant read the book aloud to him as he rested after dinner, and in his last letter to Agrippa he said: "I liked the emotional force of your language and the richness of your material, and I do not understand why the monks are so offended. As you censure the bad ones, so you praise the good ones, but they only like to be praised" (see Marc van der Poel, Cornelius Agrippa the Humanist Theologian p118). In this work Agrippa succinctly deals with all forms of science then practised, extending to astrology, magic, the Cabala and other pseudo-scientific occult practices.